It all began during his second year intermediate when Sachin came across a salon called Daffodils which happened to train young cosmetologists into this beautifying career. "I went along with my mother who wanted to join, but soon she changed her mind. After that, it kept pondering in my mind, 'Why don't I?'" 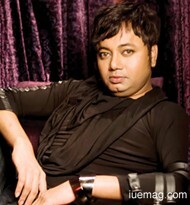 recalls Sachin Dakoji, a very well-known hairstylist, not only in Hyderabad but in India and around the world. After completing his intermediate exams with good numbers he was given the scholarship money which he used to shape his career and give his life a direction totally different from where he was headed. He recollects, "I quietly went ahead and enrolled into the six month course in cosmetology which eventually changed the course of my life, or else, I would have been a doctor"(basically a graduate of sciences). Back then hairdressing was a profession of people from the barbering community only. Respect was rare; despite his father owning a salon for twenty plus years, he refused to let Sachin join in. "I didn't give up, the rebel that I was!" he says with a tinge of smile on his face. Life at daffodils went by. Sachin was super quick to grab and excel, and he always had the tendency towards beautification. An added advantage was his passion to paint. "Six months, and I walked out with an official graduation in cosmetology. My thirst did not end there. I went on to Bombay to qualify training with Mickey Contractor and Cory Wallia for advanced makeup," says Sachin, recalling his beautiful journey of beautifying lives. His first job was at the Krishna Oberoi, now the Taj Krishna, as a hairdresser. Slowly and steadily, he built a reputation and already had stars from Tollywood lined up for his impressive works. "Five years later, I started off a new venture on my own along with two friends. It was called 'The Cutting Edge'," says Dakoji with a glee in his heart. Mr. Nagarjuna who's been the backbone in Dakoji's film career fully encouraged them for 'The Cutting Edge'. More projects followed in films. "Along the way L'Oreal was discovering younger talented hairdressers for their 'creative hairdresser forum' and I was selected," says Mr. Dakoji. What followed was a series of training sessions in Paris at the L'Oreal Headquarters and in London with some of the best talent in the hairdressing fraternity like Laurent Decreton, Christophe Gaillet, Phillipe Laurent, Laetitia Guinou, Guy Kremer, Trevor Sorbie, Mark Creed, Royston blithe and many more. This was followed by a course in airbrush makeup at Charles Fox, London. "The most remarkable moment was after five years when we went on to establish 'MANEA', a salon which was a revolution. My current partner, Padmini Velu who herself is a graduate at Pivot Point and Shahnaz Husain, has been instrumental in furthering my talent to another level," says Sachin with the utmost zeal. L'Oreal and its association made sure he received rigorous and steady training. Then, there was an upgrade in the 'chief hairdresser forum' to 'dream team' formed at the 100th year celebrations in Paris. "We were directly affiliated with 'Haute Coiffure franchise'. What went on was a year of rigorous training with Christophe Gaillet," recollects Sachin. The fruition was the show 'India in Paris' by the dream team at the Louvre in Paris. "That was the moment of my lifetime, applauded by 4000 plus hairdressers around the world. That moment India made its mark on the world map of couture hairdressing," remembered Sachin with tears of happiness. They also won the colour trophy, as well as the new generation awards. Actively involved with day to day salon work, Sachin also contributes to editorial work for fashion magazines and shows. "Fate's been on my side so far," he says gratefully. The team also has its own school of hairdressing. It has been four years since its inception. "It's very rewarding to see batch after batch come out with flying colours! We have strengthened our team to 150 plus talented professionals, and still counting. We are also fortunate to have 100 plus students from our hairdressing school," says Sachin with the pride of having followed his instincts. "It's two and half decades since my foray into this field, and I look back fondly of my struggle so far. I've been fortunate to have travelled the world for film work, explored different cultures and inspired myself. My further goals are to strengthen my skills, learn new things that are yet to come and never give up!" are the concluding inspirational words by Mr. Sachin Dakoji. Any facts, figures or references stated here are made by the author & don't reflect the endorsement of iU at all times unless otherwise drafted by official staff at iU. This article was first published here on 28th August 2014.